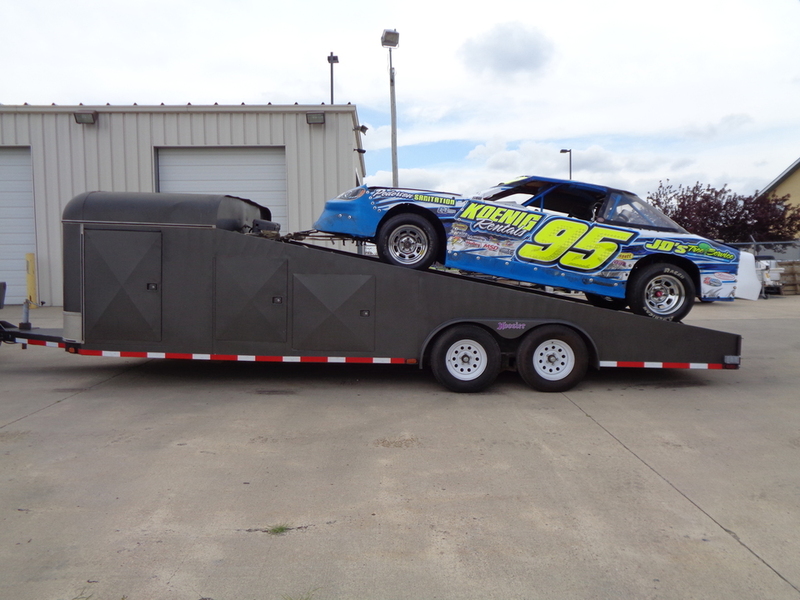 Jensen Custom Race Car Trailer. 18' Bed Space, 5.5' tongue length, 28.5' Overall Length. Three separate storage compartments that can be easily accessed from both sides. Front Storage compartment has a air compressor, Battery for winch, and cabinets built in. Air lines run to the back of the trailer for easy access. Trailer has electrical outlets on both sides. Plug in your generator and your set to go racing! Winch with controller mounted in box on top. Light weight slide in ramps. Trailer pulls easily with 1/2 ton truck. Race Car and Parts in the pictures not included. Air compressor stays with trailer. Very nice set up for a race car, but has many other uses. $4550 offer, or interesting trades. We consider anything for trade and can help with financing with approved credit from our local lenders. If you have any questions or would like to schedule a test drive, please call 515-955-3399. You can also visit as at our shop at 2944 5th Avenue South, Fort Dodge, IA 50501 from 9 am to 6 pm Monday through Friday and on Saturday 9 am to 3 pm. For inquiries after hours or scheduling an after hours visit, call 515-571-4401. Thank you! !